Neem is a natural anti-bacterial, anti-fungal and anti-viral asset of India ! Neem leaves keep skin diseases at bay and so are highly recommended for bathing. They are believed to soothe irritation , reduce inflammation and enhance skin complexion. What more is required ?!! I am fortunate to have a 15-year old Neem tree just in front of my house. We enjoy the gentle breeze offered by the tree and thanks to my MIL who have grown it for us. I solicit my readers to “go green” and take a step to plant atleast one tree in your lifetime allowing the next generation to feel fresh air passing through their lungs! Though daily neem bath is advisable to those who have a neem tree in their street, do opt for neem bath when the baby/kid had developed rashes in the skin. This Mickey-Mouse bath tub was presented to Nilaa by my SIL Dr.Indhumathi Maharajan and thanks Anni as Nilaa absolutely enjoys her bath in this tub! Add neem leaves to a bucket and half fill it with hot water. Leave it for half an hour to 1 hour. Then add plain water and check the temperature to suit your baby. 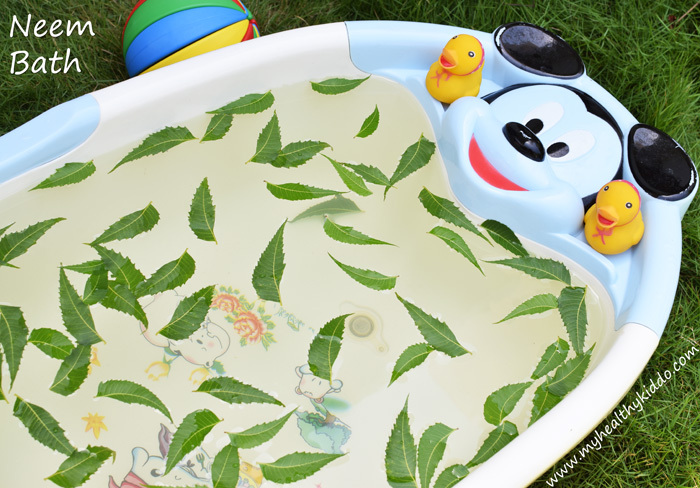 Now, discard the leaves from the water and bath your baby with this worthwhile water. You can leave the leaves in a warm water overnight and can use that water in the morning bath. If you don’t use heater/geyser to boil the water, you can directly add neem leaves to the water and boil it on stove-top. Interested people can have a look at the uses of Neem Oil by clicking this link . You shall also find 39 Fascinating Uses and Benefits of Neem Oil by clicking this link. Hi…I’m worried cause my daughter have molluscum so neem is the one of the midecine of that skin problem..so neem is safe with the kids just take a bath.I hope and I pray that this neem tree cure my daughter skin problem…thank you for sharing the neem-bath at my healthy kiddo pictures and the story of yours..
Hi ..From which age we can do neem bathing to babies?? @Janani, Neem is so natural and neem bath is pure and harmless. There is no fixed age to start.. From infants till old age, all can have..
Thanx for ur valuable suggestions .Which is very very helpful for my 6 month baby boy.if u have any suggestions pls share. @Malini, Ayurvedic references advice both Virgin coconut oil(Topical application) and warm Neem bath for many types of skin problems including Eczema. My sincere prayers for speedy recovery of your kiddo. Hope you have consulted your Pediatrician as well. @Henna, Yes, pure Neem oil is safe for all ages. Traditionally Ringworm is treated with Neem oil application(thrice a day) due to its anti-fungal property. If the infection is severe, please do consult a doctor. Plz suggest me i will b waiting for your reply thanks…. @Ruby, Virgin coconut oil is advised for Eczema. There is no harm in trying natural coconut oil application. Do give a try. But, I have no idea about vitamin E capsule. My 4 months old baby have rashes on her skin …I apply neem puree on her entire body while bathing…is it ok to apply neem puree daily during her bath??? @Nilofer, Apply virgin coconut oil 10 minutes before bath and give her bath in warm neem water. Aplying neem puree is not required for a 4 month baby. @Usha, sorry dear as I don’t have much idea about this infection. I just read that aloevera topical application helps.. As it is nature-friendly, you can try applying on your kid’s skin after discussing with your dermatologist.. My sincere prayers for speedy recovery..
Hi my 6 months old baby has some bumps here and there.. can I use neem leaf bath? Is it ok to apply neem paste on bumps before bath? @Shali, Neem leaf is generally safe for babies.. 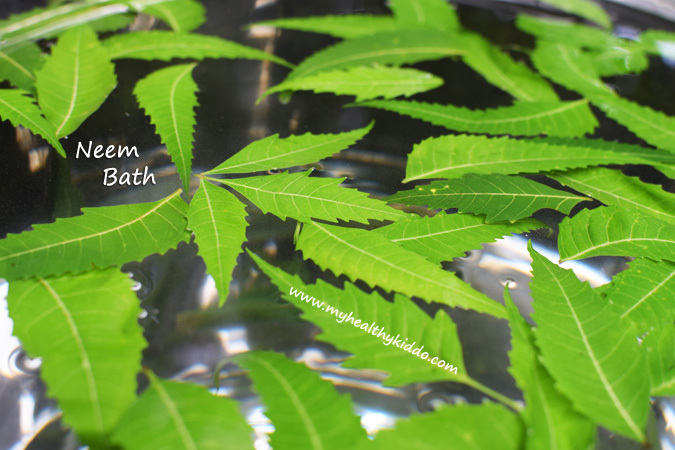 Try neem leaf bath first.. Then increase the concentration by adding ground neem leaves to bath water.. If there are no allergies, then you shall apply paste over the bumps. Hi, Fresh neem is safe for all ages.. but, make sure baby doesn’t eat the tiny ground particles.. Traditionally Ringworm is treated with Neem oil application(thrice a day) due to its anti-fungal property. You shall try organic neem oil..
My 3 month has herpes. Can i rid her of it with this neem leaf bath? @Rose, yes.. Neem is believed to alleviate many skin problems including Herpes.. External neem application like neem bath is so safe.. I am applying neem powder mixed with turmeric sandlewood powder for my month old baby….is that ok?? If baby has no skin problems, direct application of neem powder is not required.. The smell might be dormant and baby might not like it.. You shall mix the powder in the water and give a bath..
Is neem bath okay for my 2 year old? She has chickenpox. 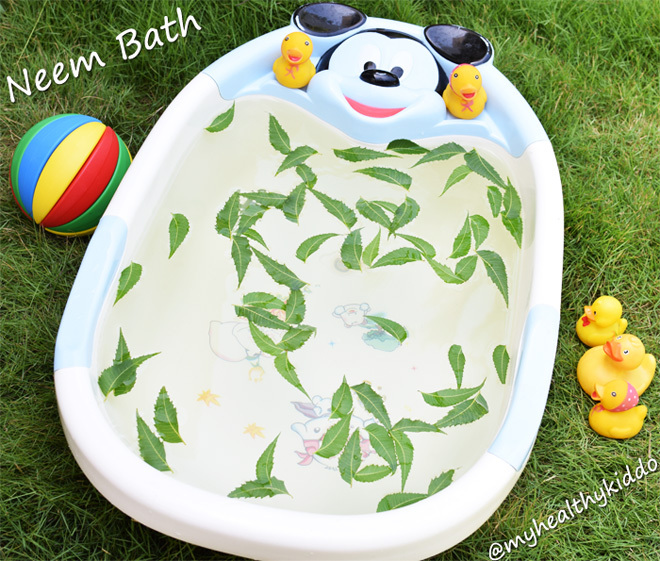 Yes, you can give neem bath for 2 year old..